At the Guardian Centre in Colliers Wood, SW London, something rather special happens: the production and recording of the Merton Talking Newspaper for the visually impaired. This has been happening since 1965 and to celebrate their 50th Anniversary money was set aside to improve the acoustic conditions of the room used both as the recording studio and live room. Serving the London Borough of Merton, the talking newspaper sends out cassettes and memory sticks of local news and information to over 200 visually impaired local residents. This service is voluntary with the actual recording run by a professional recording engineer, Denny McGrath. The room used for recording was not ideal. Denny explained that reverberation was too high, added to which the low ceiling meant that reverb was being exacerbated. There was a need for absorption and diffusion. 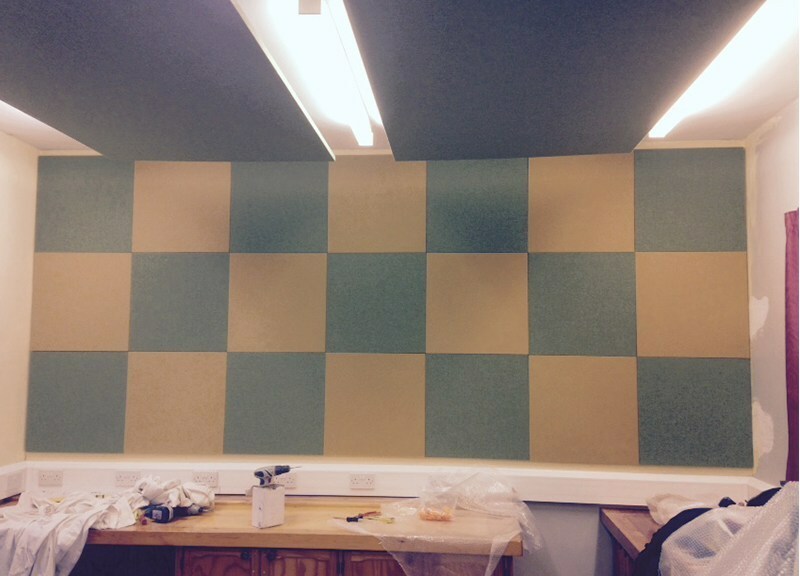 A remedial treatment scheme was designed to ensure that a plain, plastered and painted wall was used entirely to absorb and diffuse unwanted reflections; a checkerboard design of 600mm acoustic panels was then applied (photo) thus stopping any reflections. 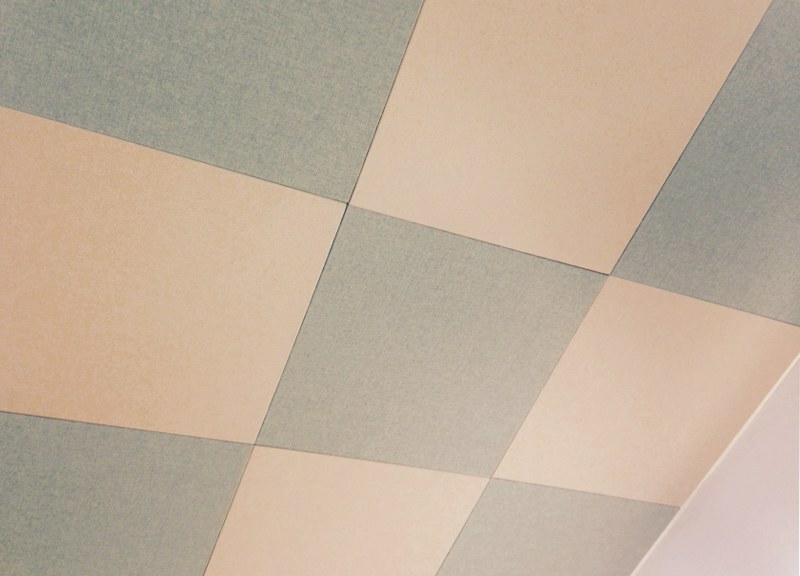 In order to compensate for the hard surface of the ceiling, 4 fabric covered acoustic panels were strategically located to remove any desk to ceiling reflections. 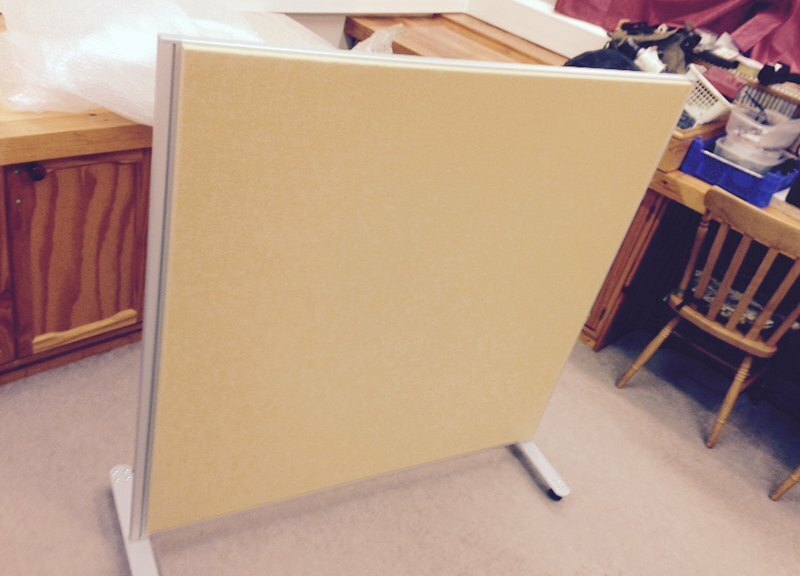 Finally, a free-standing acoustic diffuser was placed at the far end of the room to stop the hard surfaces in the area contributing to a reduction in clarity of speech. 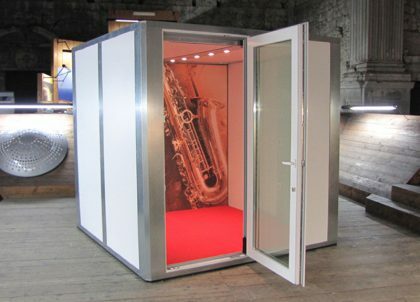 This can be moved around depending how many people are being recorded at the same time – an inexpensive but flexible approach to room tuning. I am extremely pleased. The audio difference is noticeable as soon as you enter the room. We did our first recording on Thursday and it really improved the sound. I cannot understand why it was never done before. The panels on the wall look really good and the chessboard pattern is better than what might have been a bland looking wall of tiles the same colour. Many thanks to you and your very professional team.